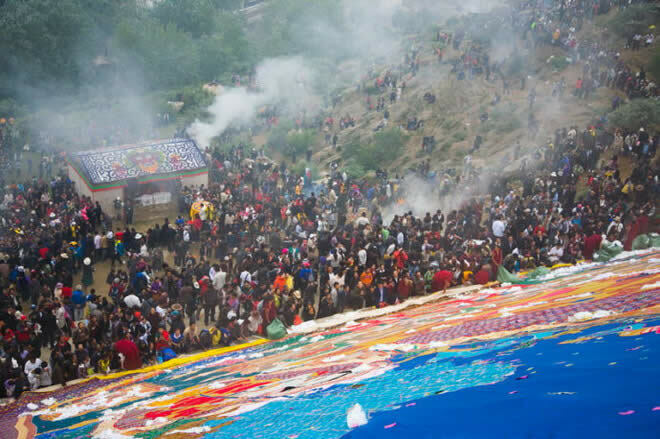 Buddha exhibition in Drepung Monastery, Lhasa on Shoton Festival: a sea of people, unprecedented, the dialogue between man and God, thousands of people in the carnival, it is amazing! 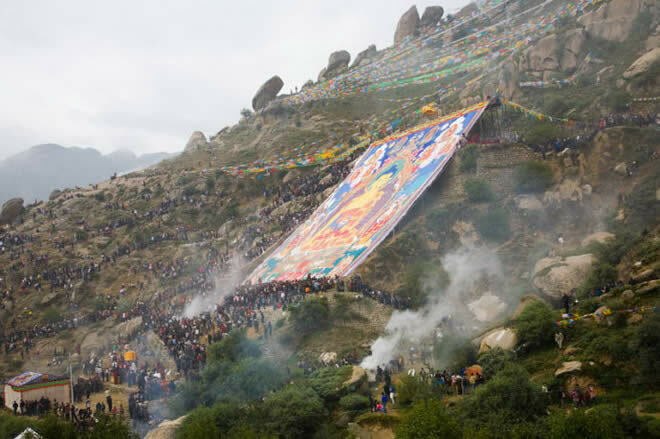 At 8 am, on the hillside behind the Drepung Monastery, in the first light of the Shine, accompanied with dignified, solemn bray, a 500 square meters Sakyamuni Nigeria Buddha which was weaved with a colorful silk slowly unfolded before our eyes... ... tens of thousands of believers and tourists were all infected by the hands together, and worshipped. 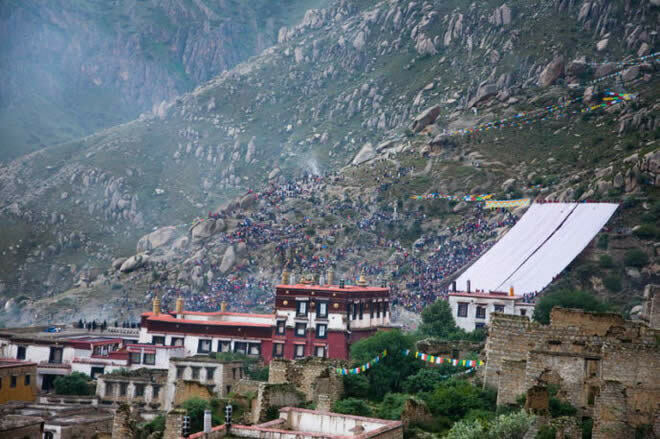 About eight oclock on the 20th Aug morning , the annual Exhibition of Buddhist Drepung Monastery in Lhasa officially kicked off, this is one of the biggest festival in Tibet, tens of thousands of Tibetans and tourists came here, forming a large number of teams, the scene is very spectacular! 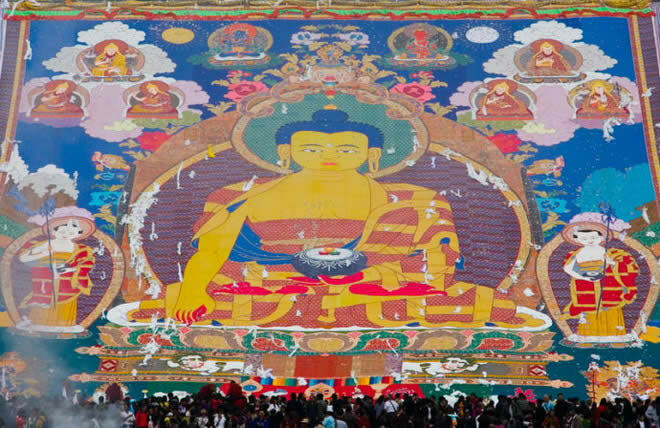 In the first light of sun shine, accompanied by dignified, solemn Fahao sound, a 500 square meters colorful Buddha silk slowly revealled before us. 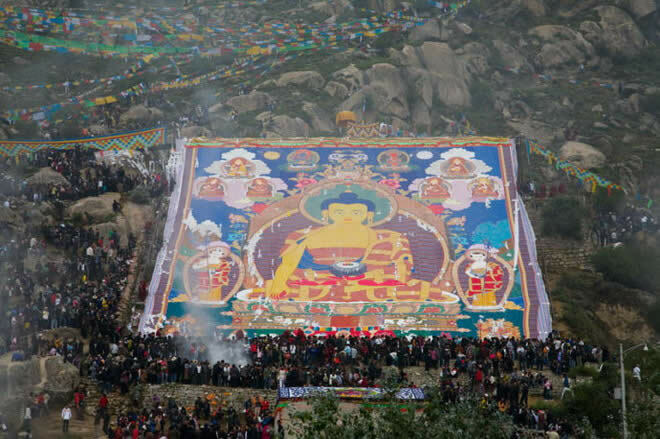 Buddhas peaceful and the crowd noise was in sharp contrast, and made me filled with emotion! 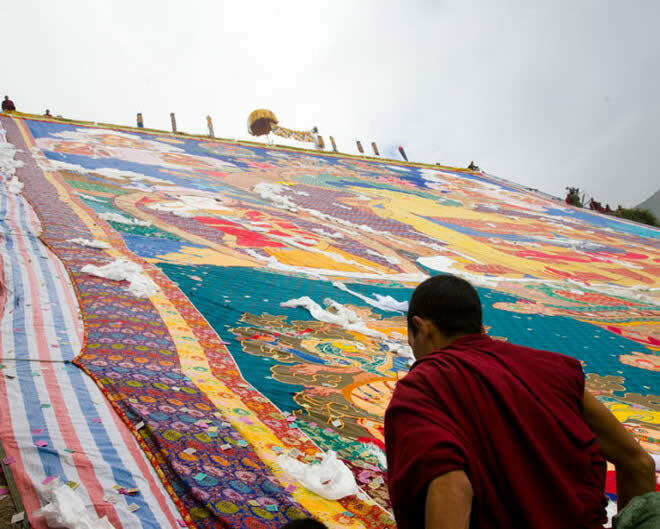 Standing in front of such huge Buddha statues, people always seem small. 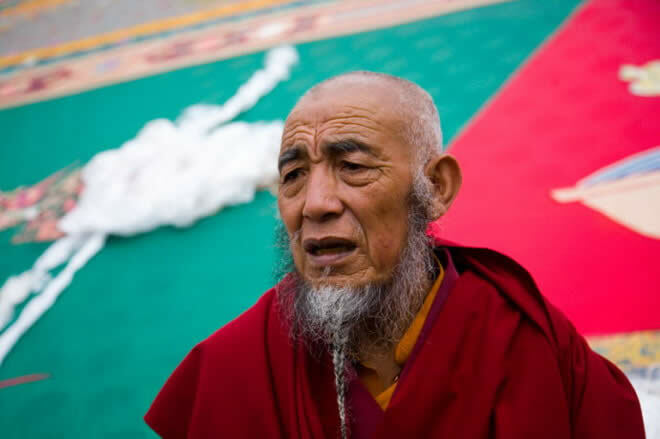 An Old lama whose hair and beard were gray, sat before the Buddha, what kind is this look, mercy, or compassion? 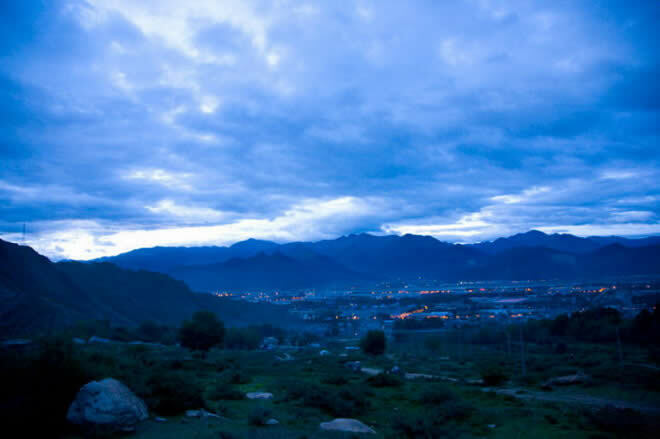 The Holy city--Lhasa was enveloped in the vast darkness, while the crowd had already went to the mountain. 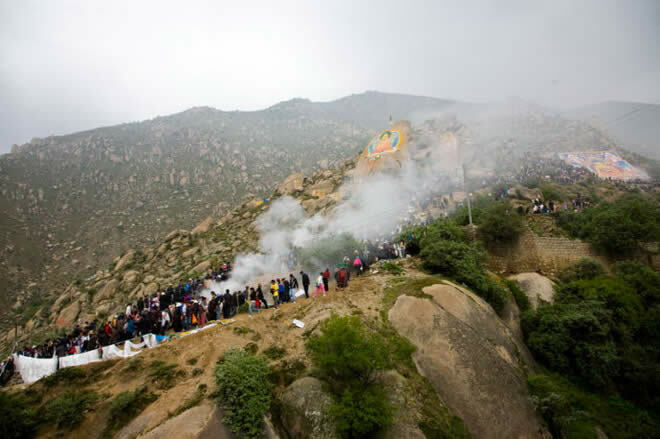 Genpei Wuzi hill behind the Drepung Monastery smoked everywhere. 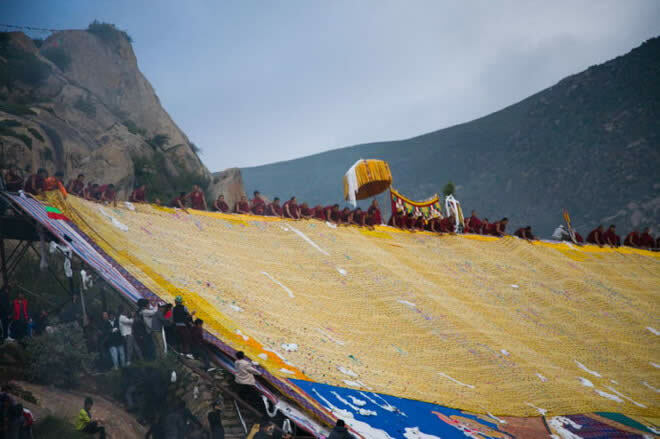 Those were the people who were looking the Drepung Monastery and the Buddha Exhibition Table in a distant. 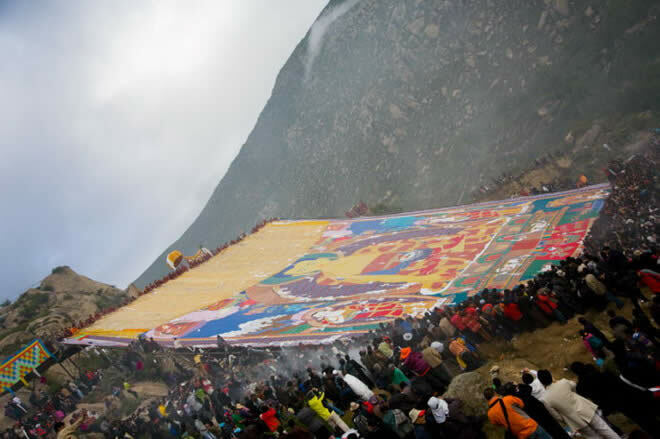 And the Buddha Exhibition Ceremony was getting started. 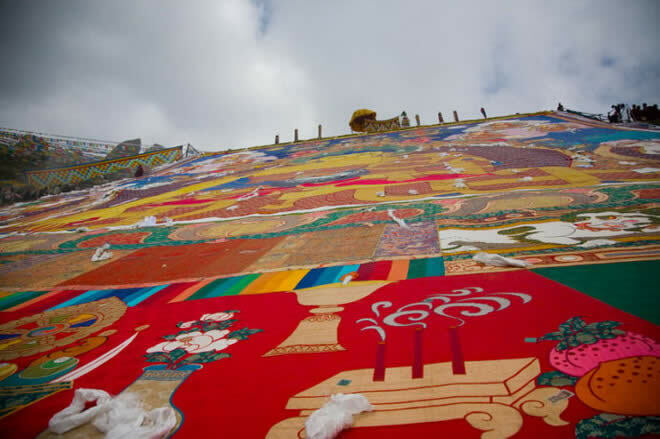 Began to show the Buddha, pull from bottom to top. 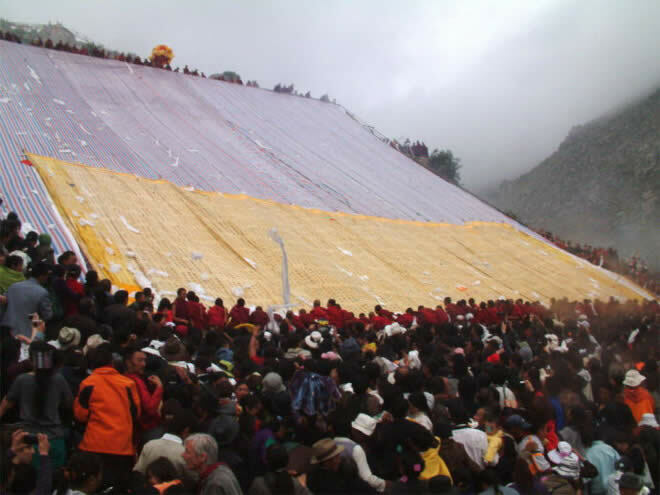 Note or not, the head of Buddha was originally covered with yellow silk. 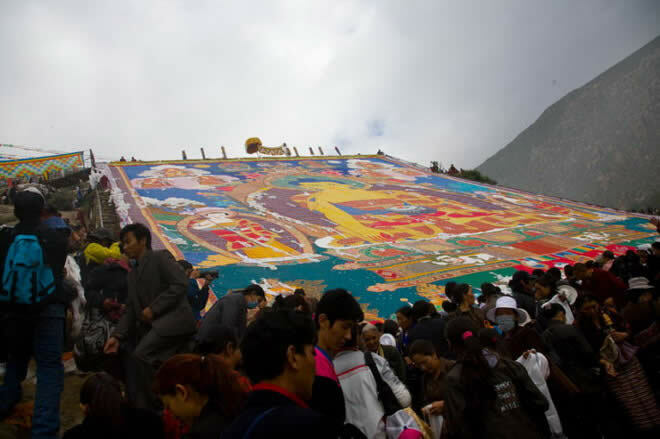 The presentation of the sacred Buddha. 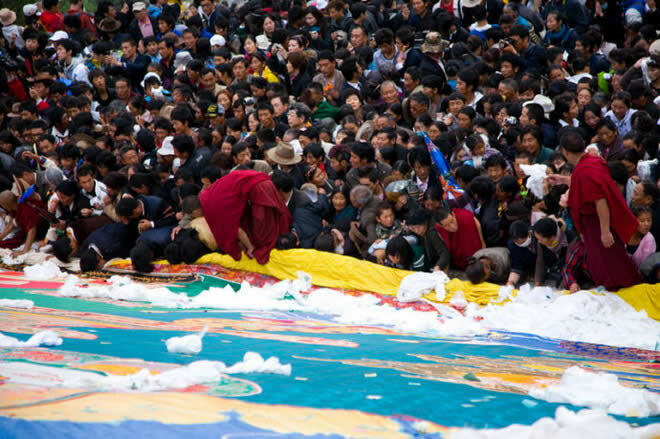 People were all thrown their Hadas to the Buddha. 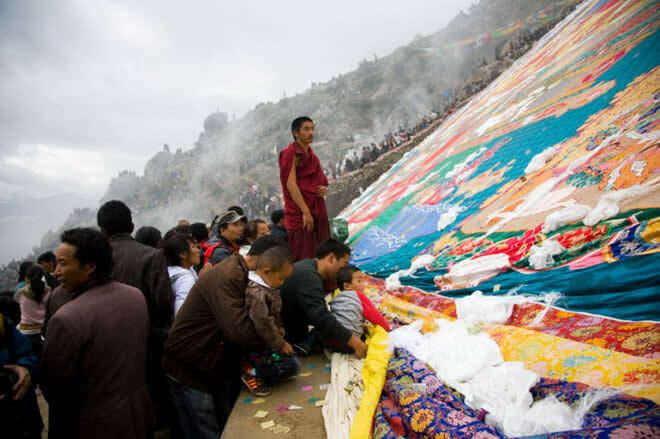 Surrounded by devout followers, who were only wanted their foreheads to touch the sacred Buddha. 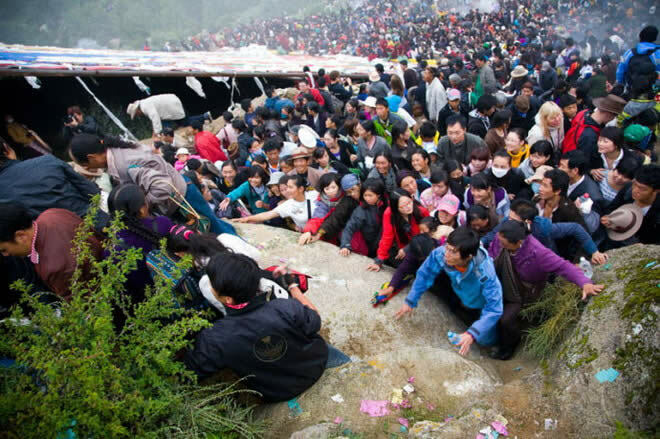 Although crowded, but people still queuing at the order came up, accepting the monks of Mount Top. 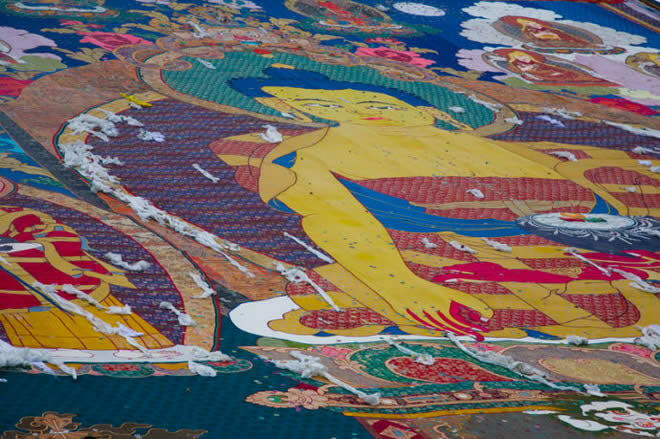 Buddha was filled with white hadas below, so that monks had to picked them up in the bag. 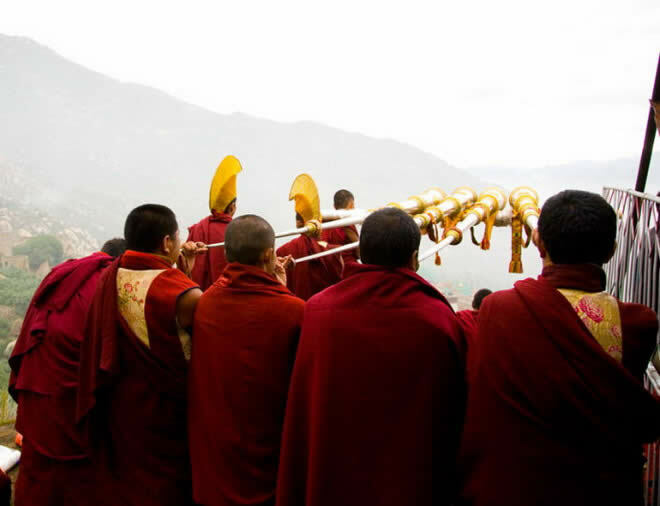 Solemn, deep Fahao sounded from time to time, echoed in the valley. 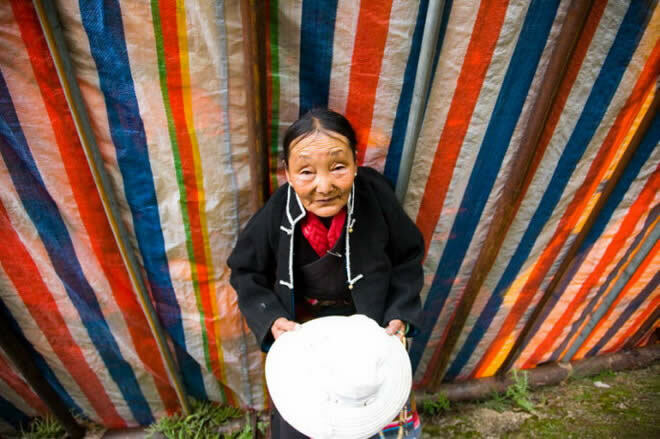 Old grandmother touched the statue with her forehead and body, praying peace. 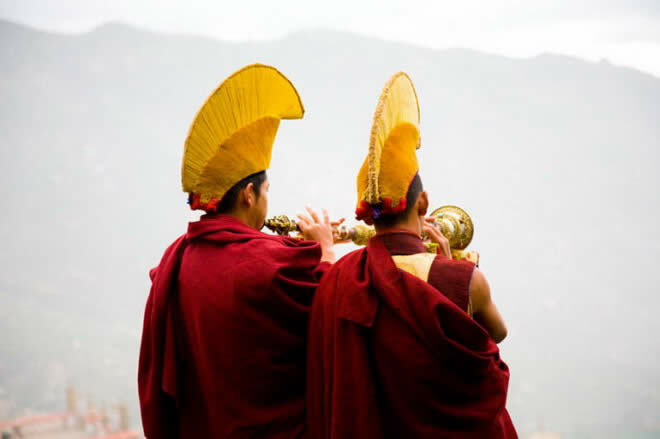 Mountains are mostly stone, steep slopes, people crowded together, could not backward, but only slowly forward. 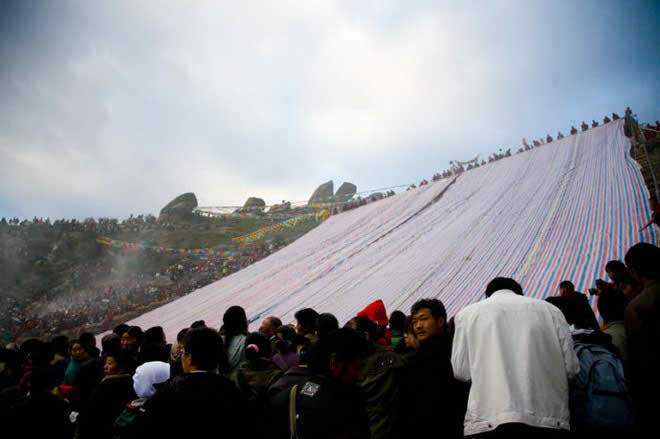 I was here at least half an hour to squeeze up the slope. 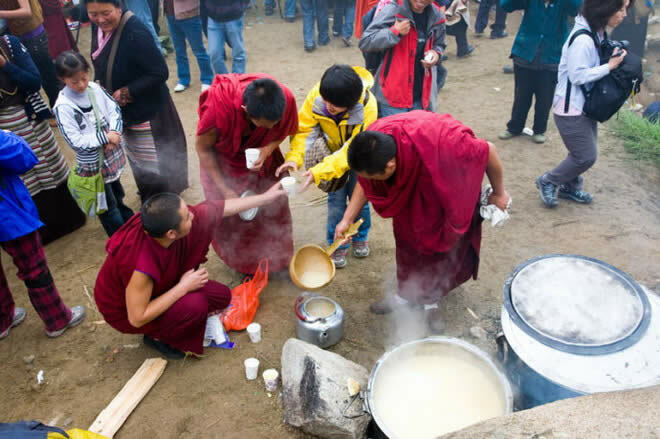 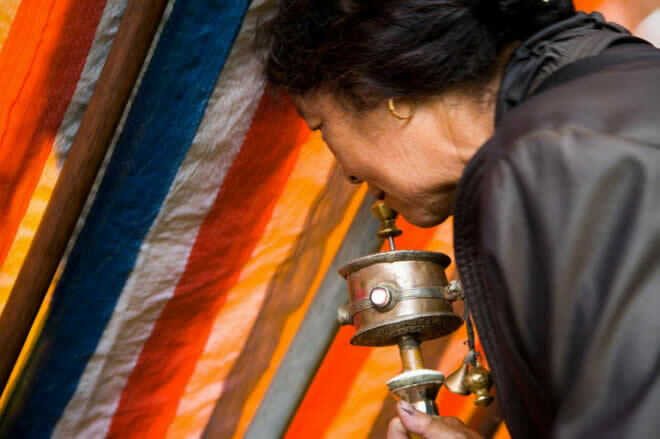 Lamas cooked butter tea for staffs in the field. 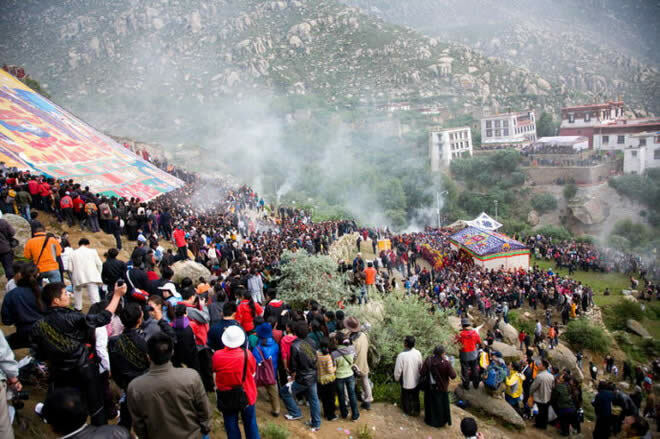 To experience the grand Buddha Drepung show, you must go to the scene, when you import the pilgrims in the crowd, the kind of shock is unmatched.